The ale by which all others should be measured. With its famous cloudy sediment and its distinctive balance of malt, hops and fruity characters, the old 'Red Label' is a tasty slice of Coopers history. 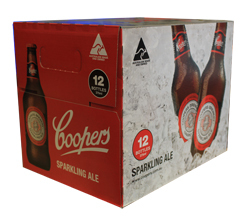 Little has changed since Thomas Cooper produced his first batch of Coopers Sparkling Ale in 1862. It's still brewed naturally using the century old top fermentation method and it still tastes great! Sparkling Ale contains no additives or preservatives. If I die tomorrow my last thought will be of this beer! Drank this all the time whilst in Oz (well when funds allowed it anyway) It has a real nice light taste and you should get some.